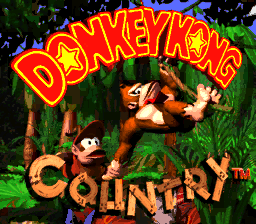 Developed by Rare in the United Kingdom, Donkey Kong Country started out in English, unlike most Nintendo-published games. Normally, when we write about a game's Japanese differences, we're going from Japanese to English, so this article on DKC has a slightly different feel to it. In Japan, Donkey Kong Country is called "Super Donkey Kong." The Japanese title screen has different artwork to go along with its new title logo. If you wait on the title screen, the U.S. version repeats its intro sequence endlessly, whereas the Japanese version plays a game demo video before the intro starts over. The demos cycle through four levels: Jungle Hijinxs, Misty Mine, Snow Barrel Blast, and Coral Capers. 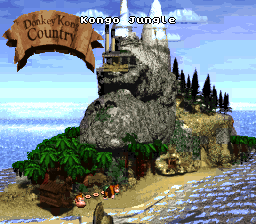 At the start of the game, DK follows a path on the world map from his treehouse to the first world, Kongo Jungle. DK can't take this path ever again, and that's probably why the path and its DK-head icon were removed in the Japanese version. 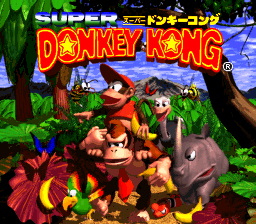 The Kongs and Kremlings did not undergo any major name changes for the Japanese version. In fact, the Japanese ending sequence still shows the character names in English. Though the Japanese level names and dialogue provide katakana versions of some of the character names, the puns are lost in translation. ボスクイーンB Bosu Kuīn B Boss Queen B. Queen B. レベル5 カントリーファクトリー Reberu 5 Kantorī Fakutorī Level 5 Country Factory Kremkroc Industries Inc.